About two years ago, Laura Murdock noticed a sudden change in her son's behavior. Almost overnight, her 8-year-old became anxious, obsessive-compulsive, and in some instances, irrationally angry. What she didn’t know at the time, and didn’t find out until October 2018, was that a strep infection was causing her son's strange symptoms. And she's not alone. About two years ago, Laura Murdock noticed a sudden change in her son Lucas’ behavior. The 8-year-old was “always happy,” but then stopped wanting to play baseball — a sport he loved — and would “get upset over the littlest things.” Almost overnight he became anxious, obsessive-compulsive, and in some instances, irrationally angry. Murdock was confused by the abrupt pivot in her child’s personality. “Even he couldn’t figure out what was going on,” said Murdock, of Boonsboro, Maryland. At first, doctors pointed Murdock down a path of behavioral therapy. What she didn’t know at the time, and didn’t find out until October 2018, was that a strep infection was causing Lucas’ strange symptoms. In the 1980s, Dr. Susan Swedo, a researcher and chief of the pediatrics and developmental neuroscience branch at the National Institute of Mental Health (NIMH), discovered a link between untreated strep throat or scarlet fever and the abrupt onset of obsessive-compulsive disorder, coupled with “out of the blue” symptoms of anxiety, sleep disruption, urinary frequency, depression and cognitive decline. Researchers named the condition PANDAS, or Pediatric Autoimmune Neuropsychiatric Disorders Associated with Streptococcal Infections. According to the NIMH, it occurs when the strep bacteria cause cross-reactive “anti-brain” antibodies to target the basal ganglia, thus provoking neuropsychiatric symptoms. “There are strain specificities of the strep — so you have to get the wrong strep — and there are also genetic vulnerabilities, so it’s literally that perfect storm of the bad step in the unlucky child provoking the production of cross-reactive antibodies,” said Swedo, who added that it’s hard to determine whether PANDAS has always existed and now just has a name, or if more cases are occurring. Experts suggest it’s also possible that PANDAS is a variant of other post-streptococcal autoimmune disorders. PANDAS Network, an organization that provides support and raises awareness for PANDAS, estimates the disorder affects 1 in 200 children, and most get it before they reach 13. “The average child has one strep infection every school year, and usually two. So if you’re going to have this kind of problem happen, it’s going to happen on one of your first exposures to the strep, rather than later in life,” Swedo said. The strain of strep that causes PANDAS is a “sneaky one that sort of lingers in the throat for a few days,” Swedo explained. Because of this, it’s possible that a child with PANDAS never presented symptoms of strep throat, but instead came into contact with a friend or sibling who did. When it seemed like therapy wasn’t working and Lucas wasn’t getting better, Murdock started digging for answers. She went on message boards and Facebook groups, and eventually found descriptions of symptoms and experiences that lined up with her son’s. She took Lucas to the pediatrician and asked whether the doctor was familiar with PANDAS. “I begged her to swab my child’s throat, and he had no typical symptoms of strep throat — no sore throat, no stomach pain; he did not have a headache, no fever,” Murdock said. Murdock was relieved: There was finally an explanation for her child’s uncharacteristic behaviors. Lucas started treatment right away. “Within 48 hours, he was pretty much a normal, happy kid,” Murdock said. But that didn’t last for long. Some patients require immunomodulatory treatments, such as over-the-counter anti-inflammatories or low-dose steroids. And many receive standard psychiatric therapies to treat the depression, anxiety and obsessive-compulsive tendencies that come with PANDAS. The most severe PANDAS cases often require more advanced immunotherapy treatments, such as intravenous immunoglobulin (IVIG), and in some life-threatening instances (either because the child won’t eat or is exhibiting suicidal tendencies), plasmapheresis. After tracking down a PANDAS specialist in the D.C. area — a process Murdock described as “difficult” — Lucas was prescribed antibiotics, antivirals and supplements. PANDAS kept Lucas out of school (Murdock explained his immune system had to be protected while it recovered), and intense behavioral “flares” were common — especially when he or someone around him was sick. Swedo said the flares that Lucas and many other PANDAS kids experience are common, and treating them aggressively when they pop up is key. “And hopefully the periods of remission become longer and the relapses are almost always less severe and shorter in duration, so within a few months we should be able to get that child back into a nice, normal baseline,” Swedo said. Frederick County, Maryland, resident Carol Gable has waited nearly six years to see her son do well. Gable said as a baby, her son met all of his developmental milestones. Then, at 20 months, he regressed. “He had … lost so much speech that it was down to just a word here or there,” she said. Doctors told her it was autism, but the diagnosis never made sense to Gable. “It was so difficult for him to fall asleep, and when he fell asleep he couldn’t stay asleep … And his pupils were huge. It’s terrifying,” Gable said. Gable traveled across the country to meet with doctors and attend medical conferences, hoping to find an answer. In June 2017, Gable’s son was diagnosed with PANDAS. He was almost 7 years old. “It was just so hard; it was exhausting — for him and for us. He just was not well,” Gable said. Swedo said PANDAS puts a tremendous burden on parents and caregivers, since it requires around-the-clock monitoring and care. Children who were once independent suddenly have severe separation anxiety. Previously great sleepers are restless well into early-morning hours, “and often are wetting the bed during that time,” Swedo added. Then there’s the financial burden of PANDAS. When Gable’s son was diagnosed with PANDAS, the out-of-network specialist treating him prescribed IVIG. Gable’s insurance wouldn’t cover the $10,000 cost of treatment, and instead advised her to pay out of pocket and then submit a request for reimbursement. She never received a reimbursement and knew more IVIG treatments were required. She also knew she needed an in-network doctor to help her navigate insurance coverage. Gable switched her son’s care to pediatric neurologist Dr. Yuval Shafrir. But even with applications for pre-authorization IVIG treatments, plus peer-to-peer calls with the insurance company, her son’s treatment was denied — twice. “I think if the public knew what kind of suffering the insurance companies were inflicting on young children, it is totally unacceptable. It’s something that is just unreal,” said Shafrir, who is one of the leading PANDAS physicians in the D.C. area. “A lot of families are struggling financially to try to treat this disease,” Murdock said. After the second denial from her insurance company, Gable switched tactics. On Feb 7. she, Shafrir and a number of PANDAS parents testified before Maryland lawmakers in support of legislation, sponsored by Del. Charles Sydnor, requiring insurers to cover medical costs associated with PANDAS. Both Illinois and Delaware have similar laws; other states are considering them as well. Diana Pohlman, founder and executive director of PANDAS Network, started the online-based organization in 2008 after her 7-year-old had PANDAS. Similar to other PANDAS parents, Pohlman said getting a diagnosis and finding the right kind of treatment was challenging. “It was a very, very scary time for our family,” she said. Her goal with PANDAS Network was to provide a place where parents could go to find answers, support and a list of physicians familiar with treating the disorder. “People have just been outraged at how difficult it is to care for the kids or to get care for the kids; parents have just taken it upon themselves,” Pohlman said. Another goal was to see PANDAS become more widely accepted by the medical community. “It’s been really hard to get major medical institutions involved or insurance companies involved in allowing for these medications to be given to the children. It’s been very difficult; I never imagined it would be so difficult,” Pohlman said. However, she’s hoping that will change. Advancements in research could soon lead to a clear marker for PANDAS diagnosis, called a biomarker. And a more definitive diagnosis would make it harder for insurance companies to deny coverage for physician-prescribed treatments. “I think it’s going to be a whole new field of medicine,” Pohlman said. Six months after his PANDAS diagnosis, Murdock said her son is 95% better. Lucas is still working to heal his immune system (he’s not back in school, but Murdock predicts he will be soon) and manage his flares. A service dog, for which the family launched a crowdfunding campaign, is also helping Lucas manage his anxiety. He was even able to read before lawmakers at the Feb. 7 testimony in Annapolis. “We feel like our son is back,” Murdock said. 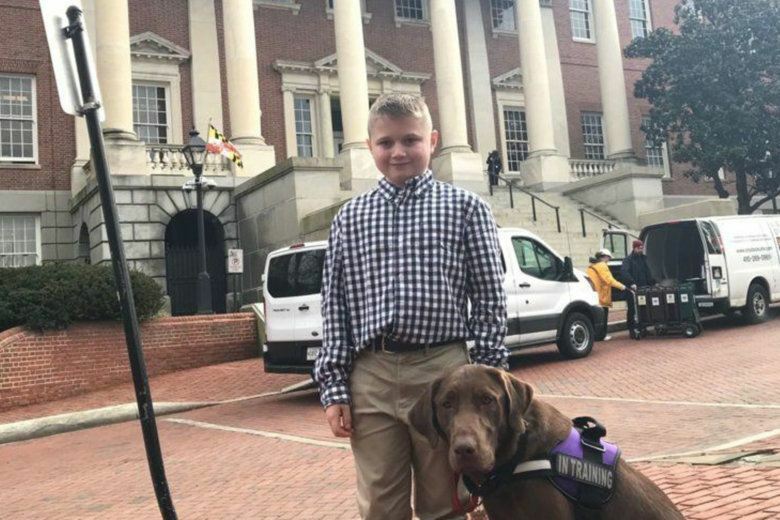 On March 13, after testifying before the Maryland House of Delegates twice, Gable received notice that the insurance company granted authorization for her son’s IVIG treatment. “I was sobbing incoherently. I just could not stop wailing,” Gable said in an email. Her son received two IVIG infusions in late March, each lasting seven hours, and he’s expected to receive more in the upcoming months. The bill introduced in the Maryland General Assembly is currently undergoing a cost analysis; Murdock said the plan is to reintroduce it next January. In the meantime, her efforts are focused on healing her son and educating other parents about PANDAS so they don’t struggle with a misdiagnosis and mistreatments like so many others have. “Don’t stop. Don’t stop fighting the gut feeling as a parent that something’s not right. If we would have just stopped, who knows where Lucas would be right now. Who knows where my son would be right now,” she said.